The 150th anniversary of the publication of the classic story Alice’s adventures in Wonderland by Lewis Carroll is celebrated today, 4 July 2015. Around the world there will be events and special publications. There is also an official website for the anniversary. Ref: Alice's adventures in Wonderland, illustrated by Arthur Rackham, 1907, Sir George Grey Special Collections, Auckland Libraries, IL:1907 RACK. Lewis Carroll’s Alice stories were created for four-year-old Alice Liddell and her sisters, who were the daughters of the dean of Christ Church. It was on the 4 July 1862, while picnicking with the Liddell girls, that he told the story of a girl who fell down a rabbit hole. Alice asked for the tale to be written down for her, so Carroll called it Alice’s adventures under ground. It took two and a half years to complete. The story went through revisions and was then published in 1865 as Alice’s adventures in Wonderland, with illustrations by John Tenniel. 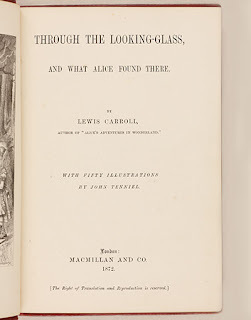 On the back on the book's success, Carroll wrote a sequel in 1872 entitled Through the looking glass and what Alice found there. In the decades since, Alice has never been out of print and has spawned thousands of new editions by hundreds of illustrators, as well as countless books, essays, films, plays and parodies. There are a number of rare and beautifully illustrated editions held in Sir George Grey Special Collections. 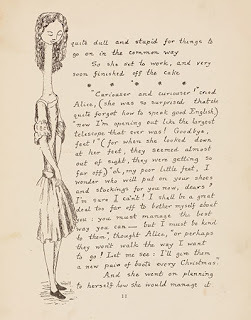 Ref: Lewis Carroll, Alice's adventures under ground, being a facsimile..., 1886, Sir George Grey Special Collections, Auckland Libraries, CHH CAR. Alice’s adventures under ground, 1886, is a facsimile and is a bit smaller than your average book. The text looks handwritten with the illustrations simply drawn. The book only has four chapters, which were expanded to 12 in Alice’s adventures in Wonderland. A quick read of the book reveals the story doesn’t differ much to the revised published version. There is a letter included, presumably to Alice Liddell from Lewis Carroll. Alice’s adventures in Wonderland, 1907, is a version which is special thanks to its illustrations by Arthur Rackham. The illustrations are stunning and detailed, with the figures being very realistic. In the illustrations of Alice, she is almost like a porcelain doll and what is obviously notable is her dress is not the well-known white and blue, but white decorated with pink roses. Figures such as the Queen of Hearts and the Mad Hatter are illustrated similar to that of caricatures, and these images have continued throughout the years. Ref: Lewis Carroll, with fifty illustrations by John Tenniel, Through the looking-glass and what Alice found there, 1872, Sir George Grey Special Collections, Auckland Libraries, 823 CAR. 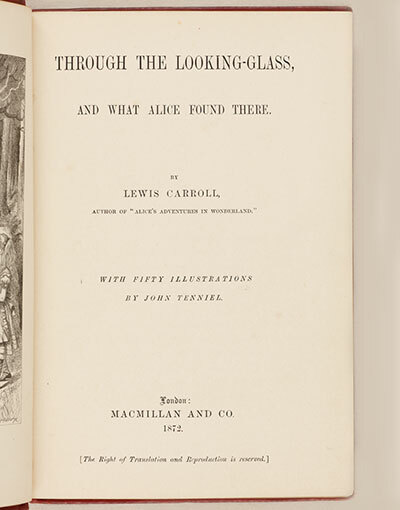 Through the looking-glass, and what Alice found there, 1872, is a first edition copy. The illustrations are simple in black and white and are in a sketch style, with directional lines clearly seen. 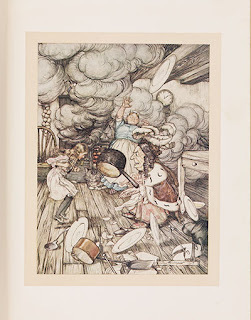 The illustrations were also reused for later publications of the book. There is an article on the library website which shows the preservation treatment undertaken on this book. For readers after a more contemporary take on Alice, the library also holds signed copies of award-winning children’s book author and illustrator Helen Oxenbury’s interpretations. 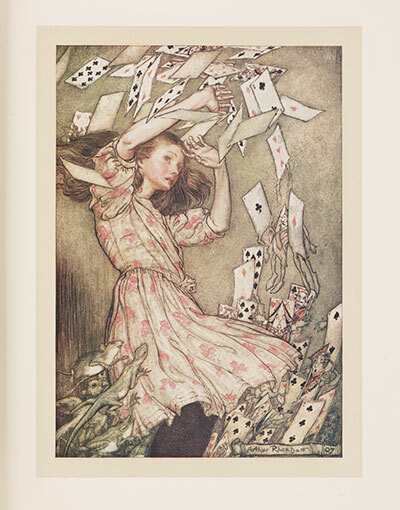 A range of Alice books will be on display in the Sir George Grey Special Collections reading room, on Level 2 of Central City Library, from Monday 6 July. Our thanks for this guest post by Ashley, a student who is spending some time with us over her mid-term break. Always nice to see Alice celebrated! A couple of corrections, though: Alice Liddell was ten when the picnic and boating trip during which Charles Dodgson told her and her sisters the story which became Alice's Adventures in Wonderland took place, not four. And the text of the facsimile edition doesn't look handwritten, it is handwritten, by Charles Dodgson, who also drew the illustrations. 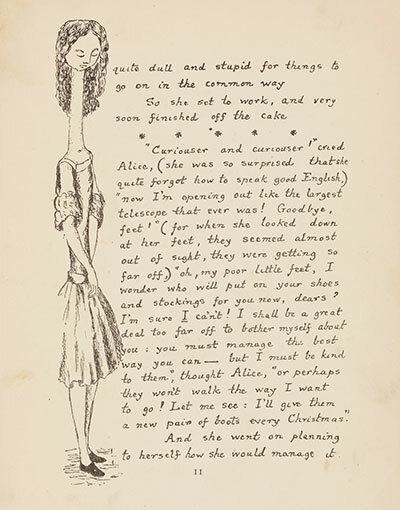 It's a facsimile of the manuscript Alice's Adventures in Wonderland which Dodgson gave Alice Liddell as a Christmas gift the year before the book was published.